In tonight’s Maundy Thursday service, I preached a series of three short homilies on scripture related to this night. While I read the scripture for each homily, some of our youth acted it out. The following is my original manuscript of these homilies. Belle (Emma Watson) dancing with the Beast. Last weekend, I saw Disney’s new live-action remake of Beauty and the Beast. Somehow, watching flesh-and-blood human beings act out the story—as opposed to cartoon characters—brought home to me just how beastly the beast’s behavior was toward Belle. Think about it: The Beast, whom the audience quickly ends up rooting for, was literally holding a young woman captive in his castle—trying to make her fall in love with him. Because only the giving and receiving of love will undo the curse of the enchantress who turned this vain, uncaring, self-centered prince into a beast in the first place. It’s as if the Beast were saying, “You better love me or else—or else I’ll never let you out of this prison!” It’s insane… It’s so wrong! Eventually, however, even the Beast realizes that he can’t force Belle to love him—that wouldn’t be true love. So he sets Belle free to return to her father and her village. The Beast explains his decision to his servants, asking, “Can anyone truly love who isn’t free?” And of course the answer is no. But something unexpected happens: In spite of the fact that the Beast had so badly mistreated her, in spite of the fact that she of all people ought to join her fellow townspeople in wanting to hold the Beast accountable for his crimes—to bring him to justice, to make him pay—she not only forgives the Beast, but she does everything she can—even at great personal cost—to save him from his death sentence. Belle’s love, her forgiveness, her grace, completely melts the Beast’s heart. He is rightly amazed that she of all people came back to save a wretch like him. He doesn’t deserve it, and he knows it. And so it is with Peter in today’s scripture. Peter often gets a bad rap for his pride, his impulsiveness, for being quick to speak and slow to think. But in this scripture I just read, Peter alone among the disciples seems to understand exactly what Christ is doing for him—and how much he doesn’t deserve it! Messiahs aren’t supposed to perform this most humble act of service—slaves are! And here we have none other than God himself humbling himself to wash these sinners and make them clean—just as he would the next day, on the cross. Brothers and sisters—friends—I believe Jesus saying the same thing to us tonight. 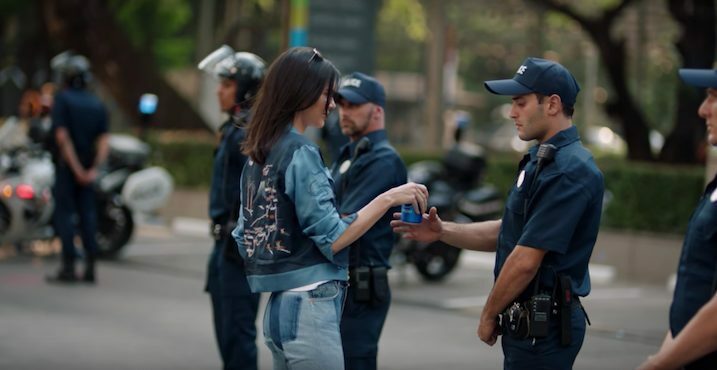 Kendall Jenner in the controversial Pepsi ad. But I don’t know… Comparing yourself to Judas and feeling better about yourself because you’re not as big a sinner as him is probably not an appropriate response. we are bad and stupid even when (sometimes especially when) we are trying to be good and awesome. Pepsi did not wake up that auspicious morning and say to itself…, ‘How can I literally offend every single person in the world today?’ They said, ‘How can we get people to buy this gross sugary drink thereby increasing our shareholder whatchamacallit and making all people love us more.” They were trying to do a nice thing. Her point, and mine, is that despite our best efforts to be good, to do the right thing, to be nice, we often end up causing great harm. Because we are miserable sinners. I am. You are. We can’t help ourselves! Literally. We can’t help ourselves. That’s why we’re here tonight! So we have not come here this evening to ask, “Is it I, Lord?” Because guess what? It is I. And it is you. It’s all of us. All of us need Christ’s blood of the covenant poured out for many for the forgiveness of sins. We pray for God’s will to be done because we don’t presume to know what’s best for us, or for our loved ones, or for the world. God does. We are finite and sinful; God is infinite, perfect, and perfectly loving. We can trust him! To say the least, if God has the power to transform the greatest evil imaginable, which is his beloved Son dying on a cross, into the greatest good imaginable, which is forgiveness of sin, salvation, eternal life—well, needless to say he can take all lesser forms of evil that we face and do the same thing. The Old Testament prophets speak darkly about the ‘cup of YHWH’s wrath.’ These passages talk of what happens when the one God, grieving over the awful wickedness of the world, steps in at last to give the violent and bloodthirsty, the arrogant and oppressors, the reward for their ways and deeds. It’s as though God’s holy anger against such people is turned into wine: dark, sour wine which will make them drunk and helpless. They will be forced to “drink the cup,” to drain to the dregs the wrath of the God who loves and vindicates the weak and helpless. The shock of this passage… is that Jesus speaks of drinking this cup himself. If you’re like me, when you heard about President Assad in Syria dropping nerve gas on innocent men, women, and children, you felt in the pit of your stomach that this was wrong… evil… You wanted justice to be done. You wanted evil to be punished. You felt a righteous kind of anger. If you felt that, then you understand, in a small way, what God’s wrath means. And if you understand the Cross of Jesus Christ, you understand that Christ, who is God, the Second Person of the Trinity, drank the cup of God’s wrath down to its dregs, in order to save us from it. 1. Anne Kennedy, “Pious Holy Week News Commentary,” http://www.patheos.com/blogs/preventingrace/2017/04/11/pious-holy-week-news-commentary. Accessed 12 April 2017. 2. Cited from Trevin Wax, “Don’t Tell Me N.T. 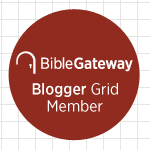 Wright Denies Penal Substitution,” TheGospelCoalition.com. Accessed 13 April 2017. This entry was posted on	April 13, 2017 at 11:42 pm	and is filed under Uncategorized. Brent, I advocate what I coined as the “doctrine of competing principles.” Two things are both right, but they can “collide” with each other in a specific situation, such that one or the other has to “give way” somewhat. Here we have Christ, who is perfect, which under at least the OT economy meant he should be blessed most of all. However, here we also have God’s love, which is so great that any sacrifice would not be too great to save sinners such as ourselves. So, how does that work out? It works out that the perfect one takes on the worst punishment that all of us deserve to accomplish the fulfillment of God’s great love–it works out with the cross. To bring this back to your point here, Jesus did in fact have to “drink the cup” down to the “dregs” to accomplish the salvation of us miserable sinners. I’ve heard it said that on the cross God’s perfect justice and God’s perfect love meet. That sounds exactly right to me. I know that this isn’t the main point of your message, but I just have to speak up on the “United thing”. United didn’t drag this guy off the flight. They told him he would have to deplane, in accordance with the written rules for handling an overbooking. When he refused, the police came and told him he was wrong and that he must deplane. When he refused they told him that they would use force if necessary to remove him. He made a choice. He resisted/refused to follow the orders of the police. (this is never something that is going to end well for you). The police had to physically remove him. His violent struggle is what escalated the confrontation and it resulted in his being injured. The three other passengers, who acted like adults and deplaned, are the forgotten part of the story. They should be applauded for their maturity. We often have to obey rules we don’t like, or that inconvenience us. Most of us learn this in Kindergarten. At airports that “inconvenience” has been amped up by post 911 security procedures. I for one don’t want to fly with someone as unstable as this man obviously was. If he was this disrespectful of authority on the ground, how might he react to an airborne emergency? C’mon folks. This guy is playing the system. He got what he deserved, but now he may get a whole lot of money for all the wrong reasons. He should have gone to jail. No, it’s not my main point… Regardless, it’s not a good look for United. The bad publicity more than pays for whatever it would have cost them to delay the transport of these United employees. And there is something sinister about people “following orders” while being blind to its effects. You’re falling for this guy’s con. He wouldn’t have taken more money. He wanted the confrontation. And, I agree that United is paying a high price in PR, because we all like to “stick it to the evil corporation”. But, this was a confrontation with the police, not United. And, it’s going to wind up costing all of us a lot more in future ticket prices. Maybe so. You’ve spent more time thinking about it than I have. I still like Anne Kennedy’s point. I understand.. It’s easy to think of a dozen things United could have done differently. But, once the gate crew had done all the things they were authorized to do, it was turned over to the Airport Police. The police operate on a pretty strict set of rules. Suppose this guy had gotten unruly in at the security checkpoint over some issue of screening him and he had refused to comply with the orders of the police, and then gotten into a physical altercation………etc. You just don’t get into a fight with the police. No matter what. You can get yourself shot. This is also what underlies a lot of the so called “police brutality” incidents that seem to happen every week now. I’ll drop it at that….